1) It's really like watching an old school superhero flick, circa the 1940s. Similar to XMen: First Class's vintage take on the Cold War, director Joe Johnston (Jumanji, The Wolfman) recreates a World War II superhero. But, unlike First Class, Captain doesn't shift in and out of eras, but rather seamlessly flows throughout creating one streamlined story that really shows the progression of the main character. 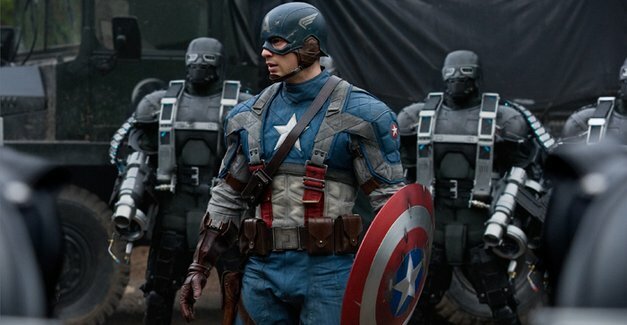 2) You won't want miss this opportunity to see Chris Evans shine in a role that was truly tailor-made for him. He takes his charisma from Fantastic Four and combines his bravado from The Losers and adds far more sentimentality than we're using to seeing him have and packages it into a surprisingly solid performance. 3) Hugo Weaving. 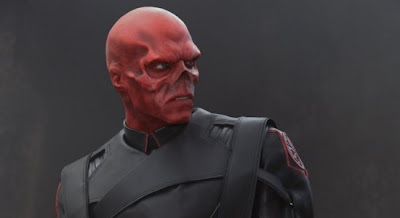 The always remarkable actor from countless movies, including the classic sci-fi flick, The Matrix, sets the screen on fire (literally) in his portrayal as villain Red Skull aka Johann Schmidt. He captivates audiences with a supremely evil character largely paralleled to Adolf Hitler. Weaving's isn't a cartoonish performance, but rather one that was clearly studied and taken seriously. 4) You will almost forget you're watching a superhero flick. With the period element, coupled with the fact that there really isn't many superhuman special effects river dancing off the screen, you'd think you're actually watching just a really good period drama. This is definitely not to say that superhero movies can't be good, but this one rides a fine line from being just another superhero blockbuster to being a true contender. 5) It captures the whole point of being a superhero, which isn't just about having superhuman powers and vanquishing bad guys. It's about standing up for something, conquering fear and becoming a hero to others and yourself. Captain America is a truly humble story that fortifies the character both physically and morally. Wow I'm glad to see it get such a high grade! I still can't get past the fact that they cast the same guy that played The Human Torch in another Marvel movie. Hopefully I can get over that after seeing this. Okay, It never occurred to me to see this movie, but after your review, I might. Loved your review on Captain America and I agree with all 5 points! Especially Evans's acting! I've never seen this side to him before and he made Steve Rogers a fully dimensional human being! Looking forward to see this later today or tomorrow. Keep hearing about how "old-school" it is so that has me intrigued although I'm not as pumped up for it as I was months ago. AWESOME! I still have to see it because I was on vacation. Sooo glad you praise it so highly.